Use the power of your framework! Don’t do the work if you don’t have to! Why stop with one event? 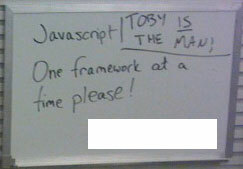 Let’s do the same in jQuery! At least, I can’t dig it up – but that’s not a bad thing! The users of jQuery (A hearty, formidable group) have created the jQuery plug-in to detect flash versions! It’s all a matter of preference and opinion and bias as to whether it should be included with the main library or not. The Framework Wars are dead. We see similar abilities in all the frameworks – and instead of bickering about “being the best” we should work on contributing and learning these frameworks. One framework at a time, please! You wouldn’t hand-over JSP code to a PHP client, would you? I really hate stumbling on sites that think just because there is a “no conflict” version we should just jam as many frameworks together that we can. That, to me, defines a lazy developer. I fight that battle – instead of being lazy and saying “I know this one better, so let’s turn no-conflict on” we should instead be saying “the client uses library X so we should develop accordingly – even if that means learning a new code!